What Kind Of COLA Can Retirees Expect In 2019? 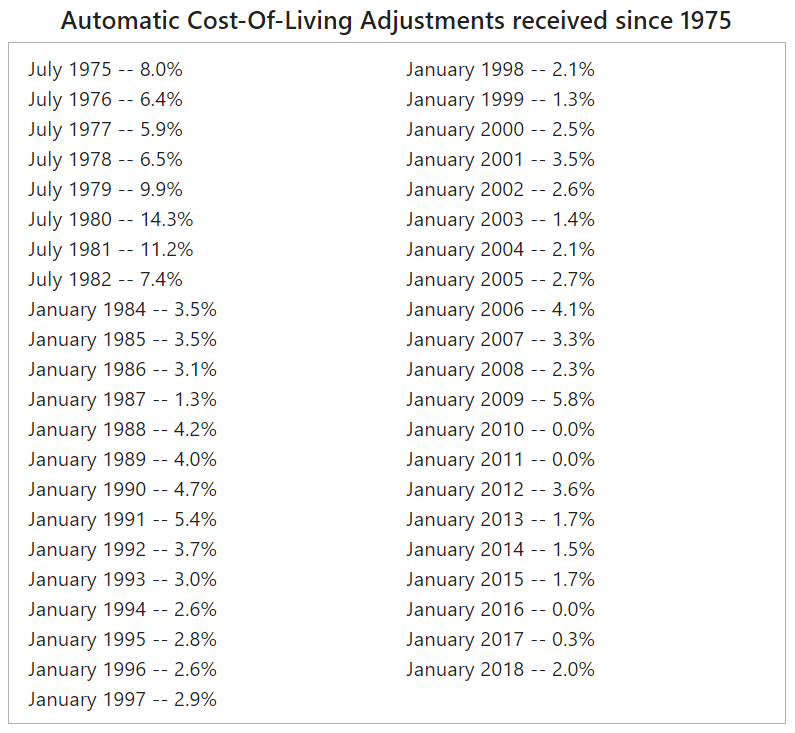 Inflation pressures cooled in August, but will the recent slowdown hurt Social Security recipients’ chances of receiving another cost of living adjustment (COLA) in 2019? We will know for certain next month when the September reading on consumer inflation is released by the Bureau of Labor Statistics (BLS) but until then we can still speculate about what retirees can expect next year. Indeed, annual COLAs are based on the percentage increase (if any) in the average level of the Consumer Price Index for Urban Wage Earners and Clerical Workers (CPI-W) for the third quarter of the current year (2018) over the average for the third quarter of the last year in which a COLA became effective (2017). If there is an increase, it must be rounded to the nearest tenth of one percent. If there is no increase, or if the rounded increase is zero, there is no COLA. The CPI-W averaged 239.668 in the third quarter of 2017, and the average for July and August of 2018 is currently 246.246, which means that if the CPI-W is unchanged in September at 246.336 (and there are no revisions to the prior two months) then there should be a COLA of 2.8 percent in 2019. That would be the largest COLA since 2012 but it could be even bigger should the impact of hurricane Florence and other variables result in a sharp move higher in September’s CPI-W reading. Overall, though, the 2019 COLA will likely still be well below the historical average, which some may argue is an encouraging sign that inflation is not quickly eroding retirees’ savings. However, that is not necessarily true because medical care costs, for instance, typically rise faster than the CPI-W, and often by quite a bit. Since retirees are older and therefore have a higher likelihood of suffering from health complications, their perceived level of inflation could be a lot more severe than what the CPI-W would suggest. Alternative measures of inflation have been proposed but for younger Americans a clear takeaway should be that long-term participation in a tax-advantaged 401(k) retirement plan and other savings vehicles can help limit their old-age dependence on the government (Social Security), and as a result lower their overall sensitivity to annual COLAs.